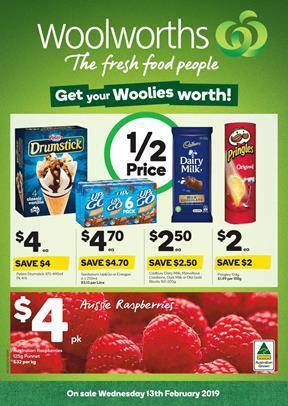 Peters Drumstick, Up & Go, Cadbury Dairy milk, Pringles chips are half-priced products. See them on the first page before you encounter Valentine's day gift range on pg 2-3. Flower bouquets, classic ideas of gifts like chocolate boxes, decorated mud cake, and more will be your choices. Gift cards, more candies, teddy bear, Bohemian Rhapsody DVD, and more products are also available in the shelf of where Valentine's Day is the popular thing. Find your favorite pantry products at dropped prices. Go to pg 6-7 for Sharwood's simmer sauce, Sunrice microwave pouch, Wokka noodles, McCain super fries, Ingham's frozen chicken breast tenders are all promoted offers by Woolworths Catalogue. Low prices always deal on some household supplies and personal care products on pg 8-9. The part of snacks is again an extensive and satisfying one in terms of discounts and variety. Nestle Kitkat, CC's corn chips, Vege crisps, and more products will cost half. A new recipe is readable on pg 11 of the catalogue. Check out Pav Coke recipe and more coke recipes in the official page of Woolworths. New tastes arrive at stores. Lindt Lindor's new flavour is pistachio. Pistachio has always been a popular flavor for chocolate bars or any kind of chocolate type. Especially in the Middle East and Europe, they love the Pistachio flavor in chocolate. You can also find breakfast foods, sauce for your meals, yogurt and more.